Just about one year ago, I posted about the Number of lines change of my ToDo list. Now the numbers of lines have grown for sure. Lines of my VimNotes ToDo and ToDo Bin notes. I dont actually have anything to say, but since I posted the numbers and figures last year, thought I might as well as post another one this year. 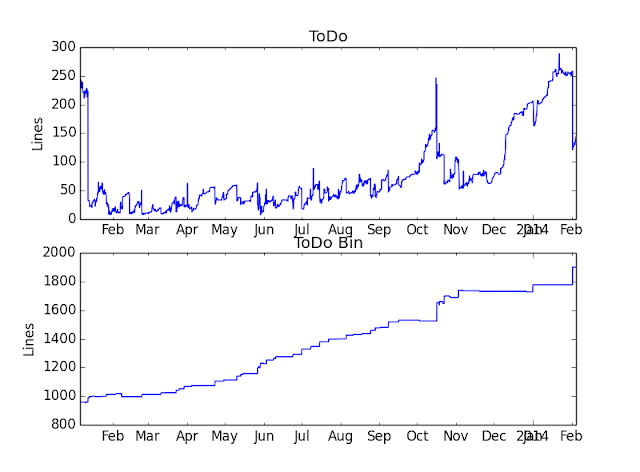 I did manage to control the growth of ToDo, but ToDo Bin still almost doubled, it has a lot of lines stuffed in. Nonetheless, its amazing to see the line bounced up and down as I edited my ToDo. When things gone little more active, the lines of notes also had received more lines as you could see in the end of last year. But if you want to have some good script to help you make notes, try VimNotes. Its a nice Vim plugin for helping managing your notes.